During the later part of his career Hornel made a speciality of pictures of young girls in a landscape, or beside a pool of water or the sea. This was a subject he had invented and he painted it repeatedly. As with 'Autumn', the oddity of all these pictures is that the children seem embedded in leaves or undergrowth. The colours and shapes overwhelm the subject. The lack of reality implies that everything, the children and the swans, is a symbol of some general idea, perhaps about innocence, although this is not specified. The paintings were popular, probably on account of their sentimentality. Hornel made a great deal of money and eventually bequeathed his large house in Kirkcudbright as a Library and Art Gallery for the town. Inscr. ‘E A. Hornel 1904 [? ]’ b.r., last figure more or less illegible. Presented by Sir Hugh Reid, Bt. 1928. Exh: Royal Glasgow Institute of Fine Arts, Glasgow, 1905 (12, repr. pl.69). Lit: James L. Caw, Scottish Painting Past and Present, 1908, p.403. Repr: National Gallery, Millbank [Tate Gallery], Review of the Acquisitions, 1927–29, 1930, p.38. James Caw stated that after his journey to Japan Hornel ‘settled down once more at Kirkcudbright [and] returned to the motives compounded of children in fancy dresses, flower-decked woods and watersides, and rich autumnal landscape’. The same children in rather similar poses appear in ‘Spring Idyll’ and in ‘Reverie’. 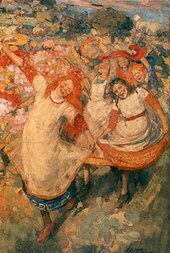 Sir Hugh Reid was an enthusiastic patron of Hornel's in Glasgow and wrote, in a letter of 16 June 1928, that he had ‘25 oil paintings by Hornel all produced - and dated (as he does with all his paintings) between 1885 and 1906’. The 1929 Tate Gallery British School catalogue gave the date on this picture as 1906, but 1904 is inscribed on the back of an old photograph sent by Sir Hugh Reid with his letter; furthermore, the picture was first exhibited in 1905.